As my wardrobe has evolved, my appreciation for seasonal fabrics has truly deepened. I admired those with the ability to swap out suits as the weather changed while I focused on building up with three and four-season suits. 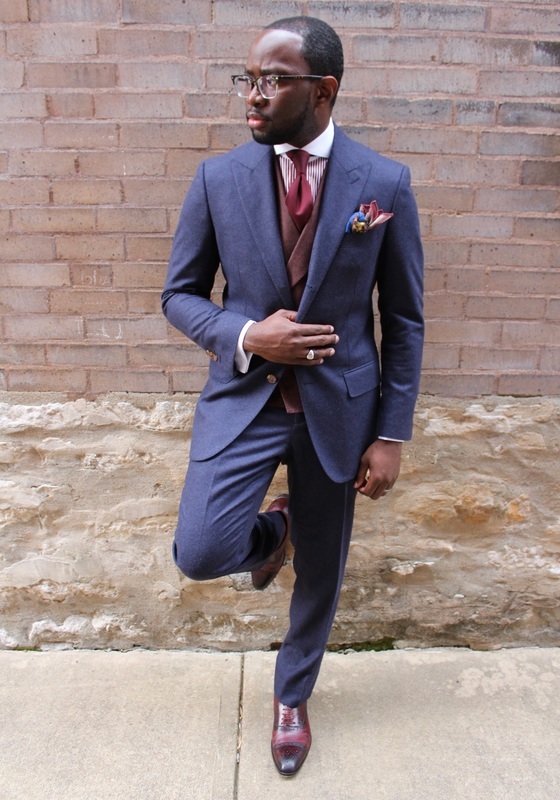 I am grateful now that I'm able to add seasonal fabrics like flannel, tweed and alpaca to my suit rotation for when the weather has a bit of a bite to it. I've grown particularly fond of flannel now that I've learned its not just the stuff of scratchy shirts from way back when. Flannel is a soft woven fabric, of various fineness. Flannel was originally made from carded wool or worsted yarn, but is now often made from either wool, cotton, or synthetic fiber. Flannel may be brushed to create extra softness or remain unbrushed. Brushing is a mechanical process wherein a fine metal brush rubs the fabric to raise fine fibres from the loosely spun yarns. 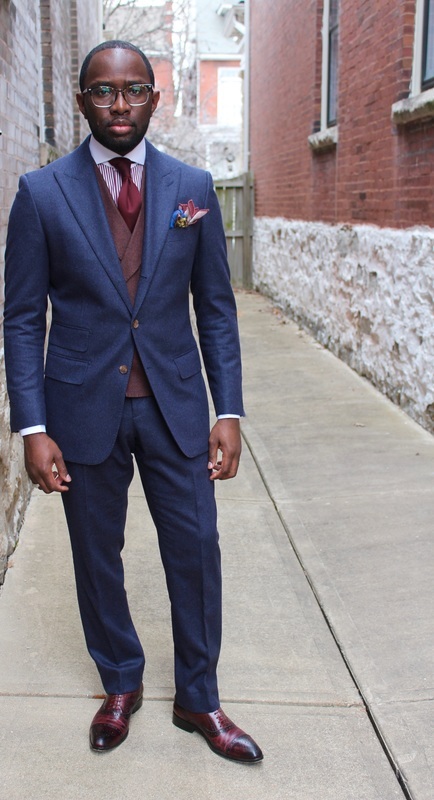 I created this "three-piece" by combining a navy Washington suit cut from Ormezzano wool with a burgundy double breasted vest, that is part of a three-piece burgundy suit, both from Suit Supply. I originally had a bolder shirt and tie combination in mind, but decided to keep it simple and solid. 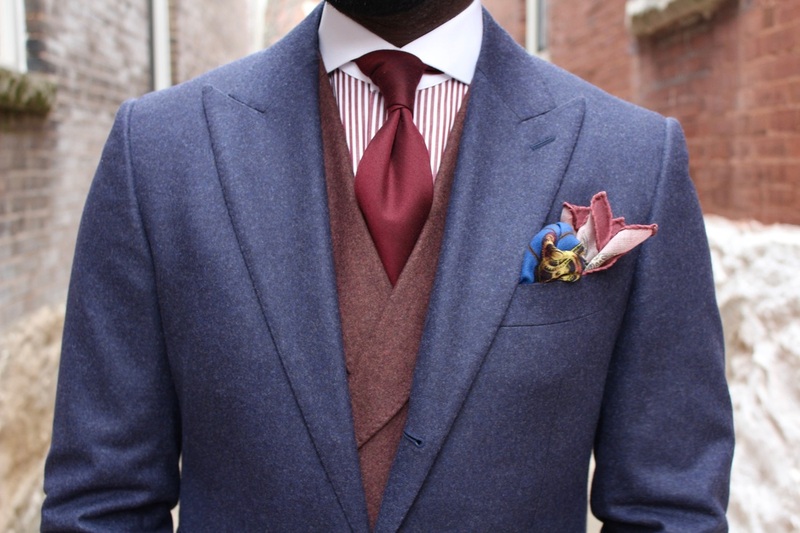 Instead, I decided to make the pocket square the focal point of this entire look. I'm really getting comfortable with going first with the things I like and after trying a number of pocket square brands, I've narrowed down to a handful that produce consistently great designs as well as generous sizes. Monsieur Fox is one of those brands and literally every day this past week, I've reached for one of their squares. So I'll end with a free tip, If you haven't checked them out, you should.